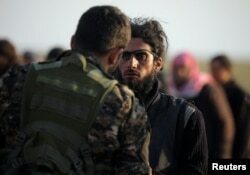 FILE - Men suspected of being Islamic State fighters wait to be searched by members of the Kurdish-led Syrian Democratic Forces (SDF) after leaving the IS group's last holdout of Baghuz, Syria, Feb. 27, 2019. Children sit on the back of a truck near the village of Baghuz, Deir el-Zour province, in Syria, March 7, 2019. FILE - A fighter from Syrian Democratic Forces checks a man near the village of Baghuz, Deir, Syria Feb. 22, 2019. Fighters from the Syrian Democratic Forces stand near a group of men, near Baghuz, Deir el-Zour province, Syria, March 6, 2019. 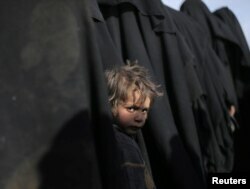 A boy looks at the camera near Baghuz, Deir el-Zour province, Syria, March 5, 2019. VOA's Margaret Besheer contributed this report.